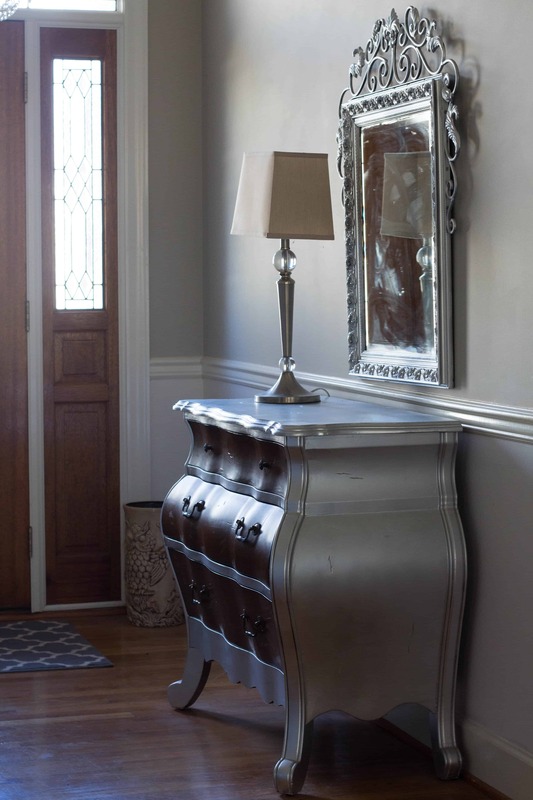 I created a foyer and hallway makeover reveal by repurposing and repainted what I had. I did a few DIY projects and purchased a few items. 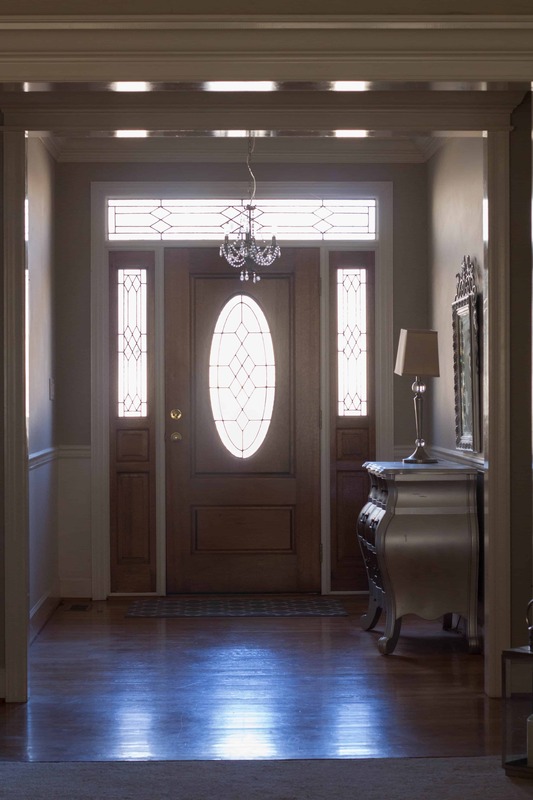 The foyer and hallway totally changed the look of my home. We remodeled our kitchen last summer and I have been slowly updating the rest of my house. Kitchen remodels are not cheap and although we saved money doing the work ourselves, it still cost us a good bit of money so I am trying to update the other rooms on a smaller budget. 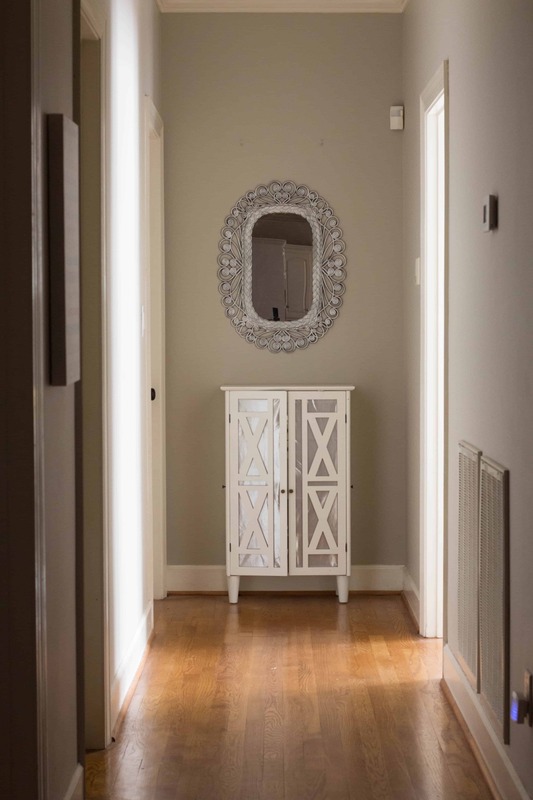 The foyer is the first thing you see when you walk into a home so I really wanted to make this space beautiful and I wanted it to go with the look of the rest of my home. I always start with doing all of the DIY projects and see if I can save money there before I decide what to purchase new. 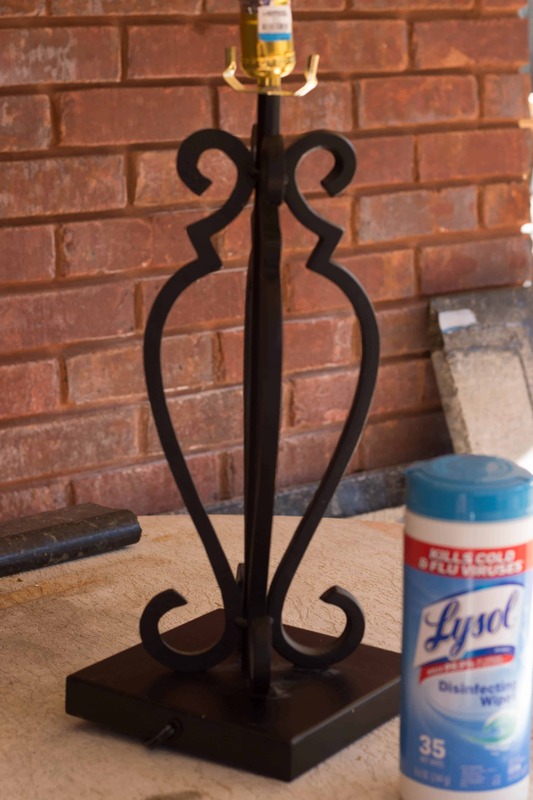 If my project is a total Pinterest fail, and it happens, I know that I am going to have to budget for the purchase that I am going to have to make. I started with the furniture. I have had this Bombay Chest for about 15 years. I purchased the chest when everyone was decorating their homes with dark heavy wood pieces. 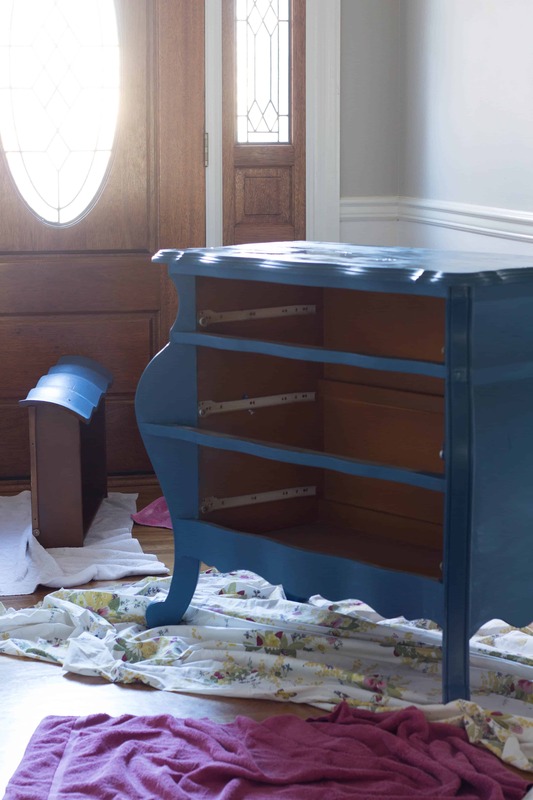 I usually try to update my furniture with paint first and if that doesn’t work well, I will purchase a new piece of furniture. Doing a google search for Bombay Chest gave me some ideas. I usually purchase a few Valspar samples when Lowe’s has their 99 cent sample sale. This color is called Deep Twilight Blue and it is a beautiful color. I love having a variety of paint colors on hand so that I do not have to go to the store. The next thing I wanted to work on was doing some kind of wall treatment on one wall. I wanted wallpaper but wallpaper is expensive. Even though it is expensive, that is where I was going to spend my budget. 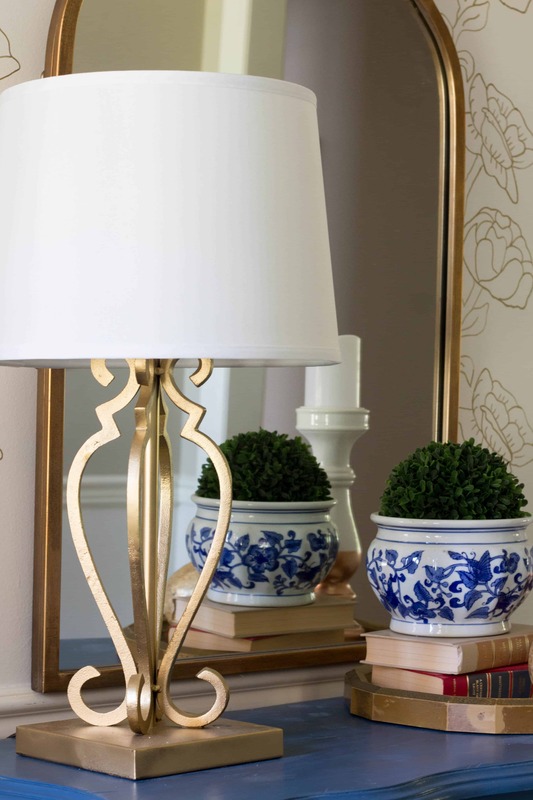 I have this gorgeous Bellagio mirror from Soft Surroundings and I really think that wallpaper would show off my mirror. While searching online for wallpaper, I was drawn to floral wallpaper that looked like it was hand drawn. I have seen where people have created faux geometrical wallpaper designs with a Sharpie paint pen so even though creating a floral design would hurt my brain, I was going to attempt it! 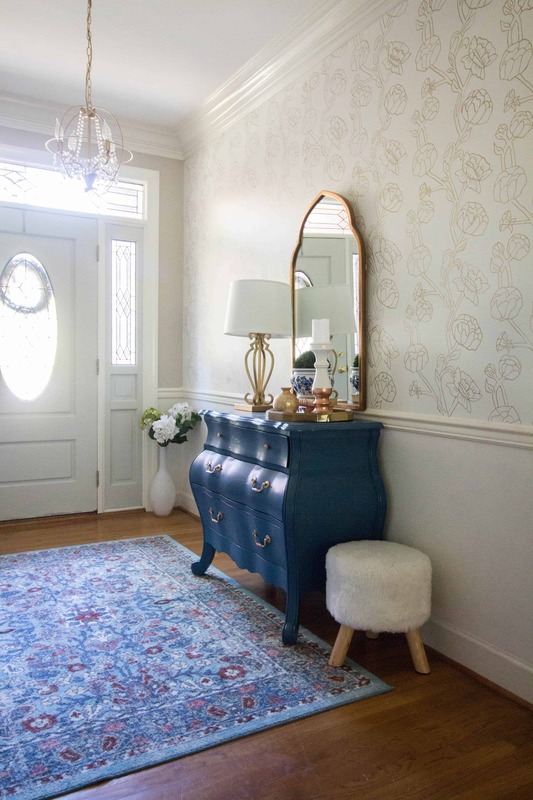 You can view the tutorial for my DIY Faux Floral Wallpaper with a Sharpie and see the steps I took to create the template and how easy it was to trace on the wall. I worked on drawing the wall for an hour a day so that it would not hurt my back. It took 8 days to draw the entire wall and it really was a fun project for me. I love doodling anyway! While I was at a thrift store, I found this black lamp for $5 and I knew that it would be beautiful painted gold. 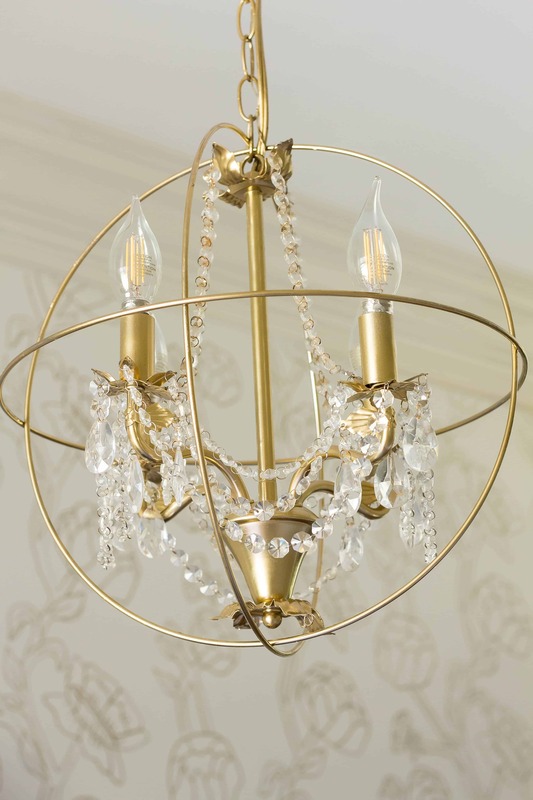 The perfect chandelier for my space is one that I found from Ballard Designs but after I walked back into my foyer, I thought that my existing chandelier looks just like the chandelier that is inside the orb chandeliers. You can see the tutorial for how I created my orb chandelier with macrame hoops and gold spray paint. Hall Navy is the Benjamin Moore color for the back wall. I added a wood mirror and a tray table for the end of the hallway. My tray table is 31 inches high and 21 inches wide and I found it at HomeGoods but I found a similar tray table here. I styled the table with items I had around my house. 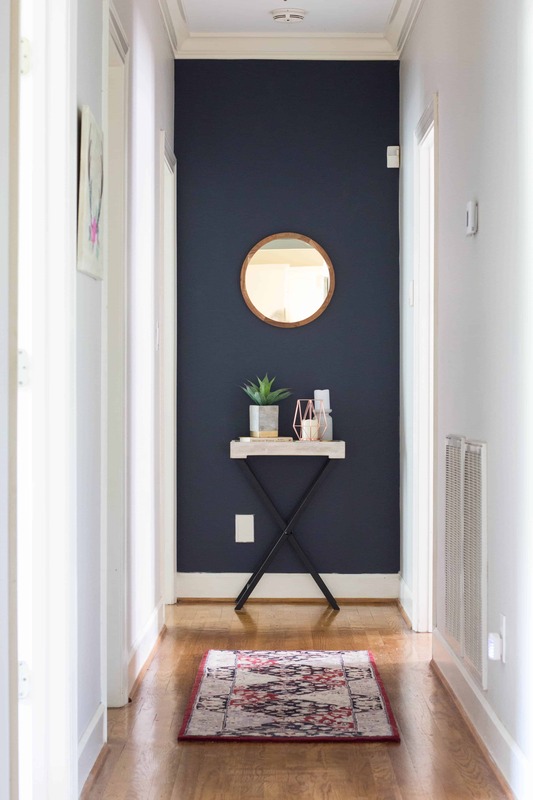 My foyer and hallway makeover reveal is the look that I was hoping to achieve. It’s funny how it always comes together in the end. I can’t stop staring at my faux floral wallpaper and the DIY orb chandelier! Love both spaces, so pretty. 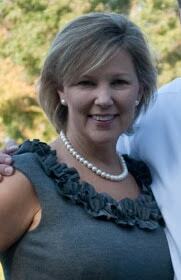 Everything turned out beautiful, Sherry! You did a great job on transforming these spaces!